Taveuni Palms Resort is the perfect Fiji luxury villa, ideally suited for a South Pacific honeymoon or for anyone seeking the luxurious feel of private island living while still having access to Taveuni’s adventure playground. The estate at Taveuni Palms is an extraordinary setting that you will not find anywhere else in the Fiji Islands. This luxury resort can be exclusively yours for a unique wedding, honeymoon, romantic getaway or be shared with your friends and family for the ultimate luxury vacation experience. 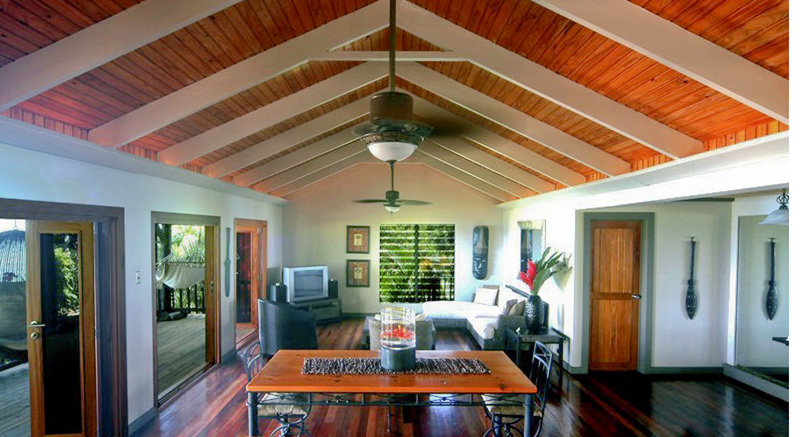 The luxurious villas at Taveuni Palms Resort are unparalleled with any other Fiji hotel accommodation. The villas, setting and amenities at Taveuni Palms are designed to offer couples ultimate privacy throughout their stay. Each villa boats five private dining locations, a private swimming pool, private beach and personal staff of seven. The luxury villas at Taveuni Palms sit elevated above a gorgeous secluded white sand beach with panoramic views of the South Pacific. The living areas of the villa face the sea and the sand delivering exclusive privacy and understated luxury. Each villa’s private swimming pool is perfectly positioned to allow the best views of the turquoise ocean. Large decks and lounges surround your pool providing the perfect setting for total relaxation during your luxury Fiji vacation. Adjoining each air-conditioned bedroom with super king beds is a luxurious bathroom complemented by a spacious outdoor shower. The outdoor showers are perfectly positioned to enjoy the moon and starlit skies while hearing only the sounds from the waves on the ocean. Cool Italian tiles, hand polished wooden floors, large daybed sofas, hammocks, lofted ceilings with fans and water hyacinth furniture create an ambiance of luxury and comfort. The expansive living areas boast an entertainment center, including flat screen TV, DVD, CD player. All meals and non alcoholic beverages are included in the tariff. Alcoholic beverages are available for an additional cost. As mentioned, there are many private dining venues for you to enjoy during your stay at Taveuni Palms. Taveuni Palms is the ultimate place to celebrate the most important day of your life! The resort has it all for the perfect wedding: a stunning ambiance, a dramatic setting on a golden sand beach framed in turquoise waters, unsurpassed attention to detail, world-renowned luxury and service, exquisite accommodations and facilities, and a romantic magic you won’t find at any other resort. Taveuni Palms also has a Director of Romance who will work closely with you to plan every detail and create the ceremony of your dreams. Diving, golf, tennis and spa treatments are among the activities available to those at Taveuni Palms. The diving in this area is some of the best in the world so be prepared for a feast of the eyes!! Taveuni Island is also full of wonderful off resort spectacles such as natural water slides where you will be deposited via waterfall to the pools below, or take a trip across the international dateline. Children are welcome here and a Fijian Nanny can always be arranged.